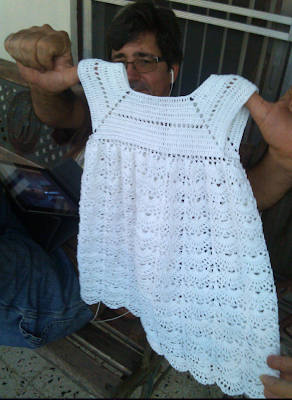 Here is the last of the Heritage Dresses, one for each of my 3 children. All I need is to wash, block, add buttons and a ribbon. This took me around 5 or 6 months, I think. I crochet slowly when it's thread. I hope to make a blanket for each, too, now, while I can. The Lord Jesus Christ bless all of you this fine Sunday! How beautiful! What wonderful work you do! :)) Those are certainly heirlooms that will be kept in the family and handed down for generations. Thank you, Lois and Sheri. :) I'm so happy I'm finished. Now I have to block it and find a pretty ribbon for it. Beautiful! I wish I could do that! God bless you. Take care! I want one, too, pweese! heee heeee! Oh sure, just send me your pinkie measurements. Well... you ARE a little bit larger than the dress you know! omg! beautiful!! Wish i could do work like that! Thank you, Caroline! I never thought I would be able make these myself, but I've been able to learn little by little.